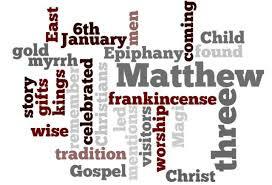 Today is Epiphany. What does that mean to most people? Not much, at all, but for Orthodox, Catholics, and now, many Protestant Christians, it is the 12th day of Christmas and signifies the “manifestation” or “revealing” of God in human flesh in Jesus Christ. It is also the day that tradition says the “three” (?) wise men (?) visited the baby Jesus. I put the question marks in the previous sentence because it is questionable the number of persons who visited the Christ child, and if, in fact, “wise men” is the proper designation for those who visited. Forget the suggestion that there is no such thing as a wise man. I recall someone asking the question “What if it had been wise women who visited the baby Jesus?” The answer? They would have stopped and asked for directions so they would have arrived on time. They would have taken the time to clean the stable. They would have prepared a casserole. And, they would have brought cute little outfits for the baby Jesus to wear home. I’m not writing to unravel all that tradition and legend tell us about the wise men. Suffice it to say that we know more about them from tradition and legend than from scripture, and that can be perilous if we’re not careful. One thing we know for certain is that these “magi” came bearing gifts, and from them we get our tradition of gift-giving during the Christmas season. I preached yesterday about gifts. I talked about the various types of gifts that we give and receive. I think it was John Maxwell who first defined three types of gifts: 1) gift for a gift, gift, 2) gift for a favor, gift, and 3) grace gifts. First, there’s the gift for a gift, gift. You get me a gift, so I need to get you a gift, too. Next, there’s the gift for a favor gift. That’s all about spreading around IOU’s. We expect something in return, just not necessarily a gift. The grace gift is different. It can’t be repaid because it can’t be earned. This was God’s gift to us in Jesus Christ. Jesus was the first grace gift. It is ironic that the wise men came bearing gifts to He who was the gift himself, and though we talk about the gifts of gold, frankincense and myrrh, the real gift they brought to Jesus was the gift of their worship and adoration–it was ultimately, the gift of themselves. As those who seek to live as disciples of Jesus Christ, is not the greatest gift we can give the gift of ourselves? While the gift of ourselves seems so intangible, may I suggest there are tangible ways in which this giving may be lived out. First, the gift of ourselves to Christ can be lived out through our worship. Gathering together regularly with the body of Christ as a means of acknowledging the Lordship of Jesus Christ may be the most significant gift we have to offer Jesus. Why? Because it takes our time and our intentionality, and in a world filled with events and activities clamoring for our attention, we must be intentional in making the commitment to offer our worship, praise and adoration to the One who offered Himself to us. Time is the most precious commodity any of us possess, and to take that precious time to gather together regularly makes an incredible statement to the world, and to ourselves. Corporate worship is a tangible gift we bring to Christ. Prayer, bible study, meditation, and fasting are other tangible ways in which we offer ourselves to Christ. These, too, take a commitment of time and intention on our part, but these are grace gifts that we offer to Christ because He has offered Himself to us. BUILDING HOMES FOR “HABITAT FOR HUMANITY.” VOLUNTEERING AT A HOSPITAL. VISITING A SHUT-IN OR A NURSING HOME. PARTICIPATING AS A BIG BROTHER OR SISTER. GETTING INVOLVED IN AN ELEMENTARY SCHOOL, HELPING “AT RISK” CHILDREN LEARN TO READ. DONATING BOOKS TO A PUBLIC LIBRARY. WRITING LETTERS OF ENCOURAGEMENT TO PUBLIC OFFICIALS. DRIVING FOR “MEALS ON WHEELS.” COACHING A LITTLE LEAGUE BASEBALL, BASKETBALL, OR FOOTBALL TEAM. SINGING IN A CHOIR. THANKING A PERSON WHO HAS BEEN A SOURCE OF INSPIRATION TO YOU. TELLING A TEENAGER THAT THEY HAVE A LOT TO OFFER. SEWING A WARMING BLANKET FOR A CHEMOTHERAPY PATIENT. GIVING A YOUNG PERSON MUSIC LESSONS. NONE OF THESE THINGS COST MONEY, BUT THEY DO TAKE SOME OF OUR TIME. IT IS A NEW YEAR AND A GREAT OPPORTUNITY TO MAKE THINGS BETTER FOR SOMEONE ELSE. AND IT’S REALLY TRUE – HELPING OTHERS IS ONE OF THE BEST WAYS TO HELP OURSELVES. WHAT GOES AROUND COMES AROUND! Gift-giving isn’t just for the Christmas season. Generosity should be part and parcel of our lives as disciples of Jesus Christ. Let’s begin 2014 with a commitment to give ourselves to Jesus and to one another, and let it be a daily offering.